Dancing isn’t just for music, toe tapping or partying. The happy feeling has extended to food as well. Here are two happy dishes using Chicken and Rice. What makes the difference? It’s the wine of course. 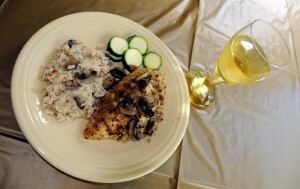 Make sure you have several bottles of white wine on hand for both food preparation and sampling. Here are two vintage recipes from the happy section of my vintage recipes. Preheat the oven to 375 degrees. Coat chicken breasts in crumbs, salt, pepper and tarragon. In a skillet, brown chicken breast in 4 tablespoons of butter. 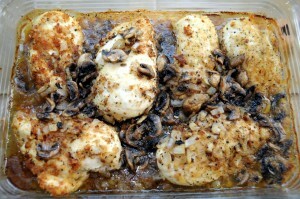 Remove chicken and place in shallow baking dish and set aside. Add onions to the skillet and cook until tender. Add in chicken stock and wine and bring to a boil. Pour sauce around chicken and bake, uncovered for 30 minutes. Sauté mushrooms in remaining butter and add to chicken. Bake an additional 8-10 minutes. Thoughts: todays chicken breasts are much larger than what was available in the 60s-80s. In this recipe, I’ve slice the breasts in half, lengthwise, before cooking. The breasts seem more flavorful. Make short work of pin-feathers by plucking them from fowl with an ordinary strawberry huller or a large pair of tweezers. Use rendered chicken fat for making biscuits to serve with chicken dishes or on chicken pie. It save “bought” shortening and adds delicious flavor. Use it too, in cream sauces to serve with vegetable or meats where chicken flavor will count. 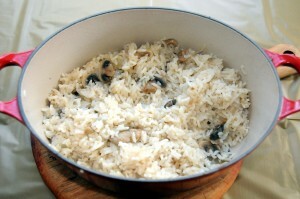 Brown mushrooms and onions in hot fat, add rice and broth and wine. Stir well. Put in greased casserole (with cover). Cook in about 300 degree oven for about 20 minutes. Use yellow casserole or pink (author’s note). Stir after about 15 minutes. Cook for 30 minutes for brown rice (quick). *Rice grains will stay separate and white if cooked in water to which a teaspoonful of lemon has been added for each quart. *Save the water in which you boil rice. It’s good to use in making gravy. It thickens itself.